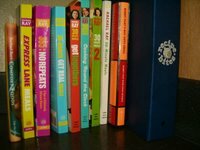 The Winston-Salem Journal's Food Editor, Michael Hastings, wrote a detailed review of Rachael Ray's newest cookbook, Express Lane Meals. As part of the review, Hastings put several recipes to the test. Results for the Cowboy Spaghetti? "Cowboy spaghetti uses a robust, meaty sauce in which hot sauce and Worcestershire sauce replace Italian herbs. It's almost like a cross between chili and spaghetti with meat sauce, with cheddar cheese capping of the Americanization of the dish." Sign me up. The second test was of a recipe I would probably not try: "Broiled lamb chops with Mediterranean potato-veggie mix pairs plain chops with an interesting mix of fried potatoes and braised fennel and onion, with neat touches of olives, mint, basil and balsamic vinegar." I just don't do lamb. Finally, the author tested the ginger-orange roasted carrot soup with spicy shrimp and concluded that it "creates a deep, complex flavor with a mix of curry, ginger, orange and garlic that gratefully does not overwhelm the flavor of the roasted carrots." Ummm, I like it when the garlic overwhelms the other flavors, so I guess I will add extra when I make it. My only disagreement with the review is that it asserts that "[t]o an extent, these recipes echo those in Ray's other cookbooks, magazine and on her main show, 30 Minute Meals. The downside is that they seem a bit recycled." I agree that the recipes in the cookbook show up on the 30-Minute Meals show (which I think is good because she offers extra tips and I like seeing what it looks like when she makes it), but I disagree that many have been in the other cookbooks and magazine. With a few exceptions, I have not noticed that at all. And trust me, I would notice. Finally, the author has the gall to suggest that one Rachael Ray cookbook may be enough for most people. 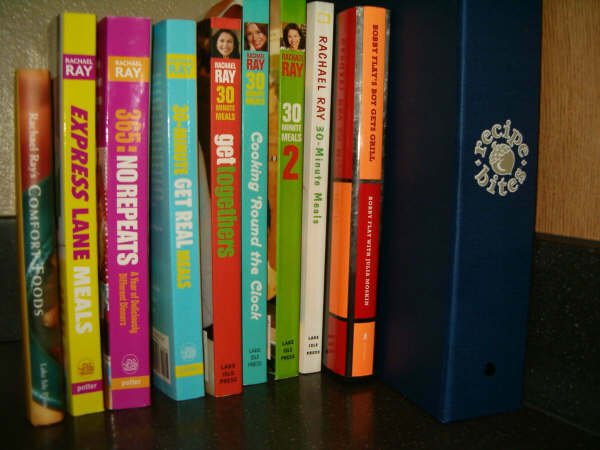 As you can see in my picture above, one Rachael Ray cookbook is DEFINITELY not enough. And yes, they are in (close to) order of publication, with minor changes based upon size. Now go get Express Lane Meals and start (or supplement) your own collection! Hey, I see an excuse to go shopping - you need her Open House cookbook. ;) I'm with you on the lamb - don't do it. Seriously. If it didn't cost 120 bucks, I would SO buy it.